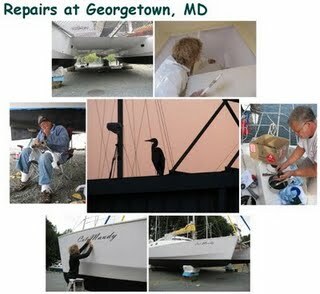 Rich from Georgetown Yacht Basin, Galena MD worked on Cat Maudy’s saildrive problem. He had the drives out of the boat a couple of hours after we were blocked on the hard. 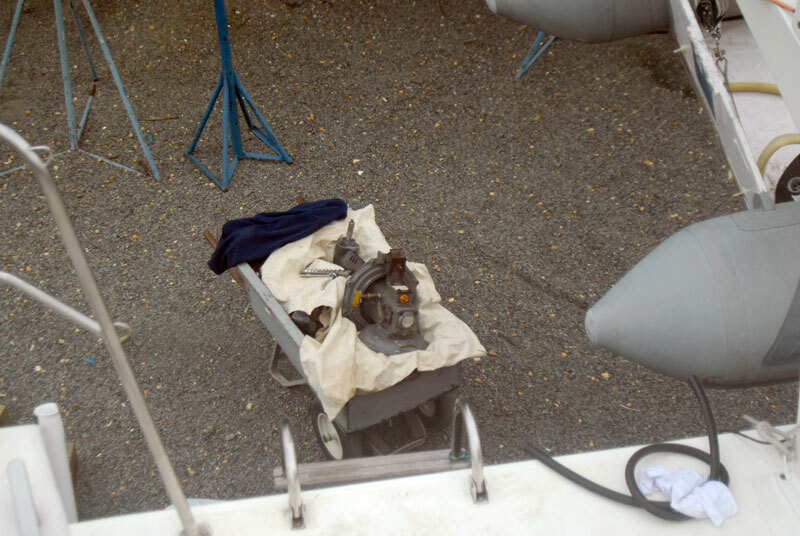 Rich found that in addition to the rubber diaphrams we needed prop shaft seals and damper plates on both drives. I cleaned and lubed the Variprops. We replaced all the engine control cables except one. We put the “Cat Maudy” graphic on the bows and put on some bottom paint. Jane painted the forward v-berths. Repairs went quickly and on friday 9/18 we were ready to go back into the water. Finally, the fix is in and we leave the “Big Cat House” at Georgetown Yacht Basin early in the morning. Destination Baltimore MD.